(Ross D. Franklin | The Associated Press) This May 31, 2018 file photo shows the reduced water level of Lake Mead behind Hoover Dam in Arizona. Arizona is nearing a deadline to approve a plan to ensure a key reservoir in the West doesn't become unusable as a water source for farmers, cities, tribes and developers. Other Western states are watching. The U.S. Bureau of Reclamation expects full agreement on a drought contingency plan by Thursday, Jan. 31, 2019. Phoenix • Arizona lawmakers face a deadline Thursday to let the state join a drought plan for the Colorado River or risk blowing up a compromise years in the making for the seven states that draw water from the constrained river. The House and Senate are scheduled to debate the legislation in marathon sessions on Thursday. The Legislature's approval would be the final puzzle piece that avoids potentially more severe cutbacks imposed by the federal government. U.S. Bureau of Reclamation director Brenda Burman has said she's facing pressure from other states to limit Arizona's water deliveries without a complete drought plan. 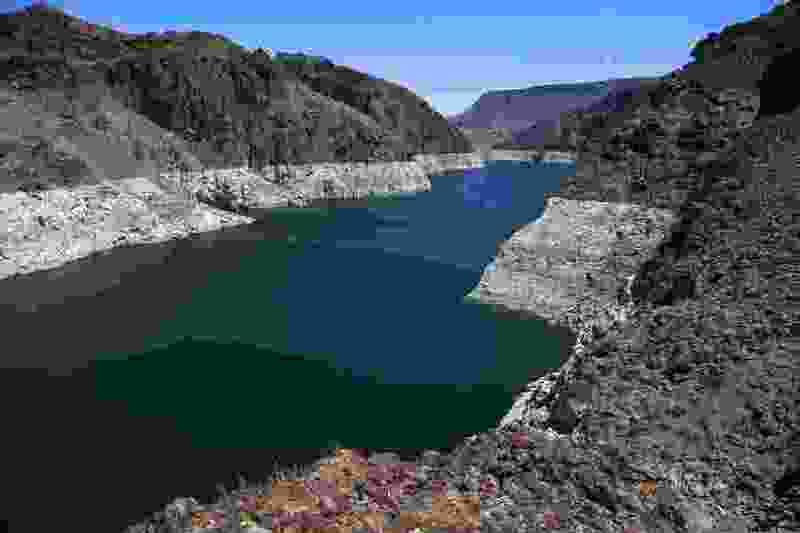 Arizona has the junior rights to river water and would be hit first and hardest if Lake Mead on the state's border with Nevada drops to shortage levels. Burman set a Jan. 31 deadline for all parties to agree to voluntary cutbacks before she’ll begin proceedings to impose them. In Arizona, most residents would not see an impact from the cutbacks, which would primarily hit farmers in Pinal County between Phoenix and Tucson, who have the lowest-priority access to Colorado River water and stand to lose the most. The Arizona legislation is the product of months of negotiations between major water users in the state, who agreed to reduce their own water take in exchange for cash or access to groundwater in the future. The farmers, who reluctantly supported the agreement, said the agreement would still require them to fallow as much as 40 percent of the county's farmland. Arizona water officials say joining the agreement is critical to the state's water future, and Gov. Doug Ducey pushed hard for the plan, which he deemed the No. 1 priority for lawmakers this year. Opposition came from Sen. Juan Mendez, who characterized the deal as a giveaway to interest groups that promotes unsustainable water policy, ignores climate change and doesn't address the fact that Arizona will have less water in the future. Lawmakers are considering two measures. One would allow Arizona to join the multi-state agreement. The other includes a variety of measures to help the Pinal County farmers. Those include $9 million for the farmers to drill wells, dig ditches and build other infrastructure needed for them to change from the river to groundwater. Tucson would get more groundwater credits for treated wastewater, allowing the city to pump more in the future in exchange for providing water to Pinal farmers.